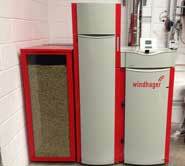 Almondsbury Ecoheat provides bespoke design and specialist installation solutions to the Commercial/Agricultural sectors and all size Domestic dwellings. Our aim is to provide the best solution for your own personal/ business situation, utilising the latest and most energy efficient green & eco friendly energy including Biomass, heat pump and heat recovery technologies. We have a dedicated team of design, installation and service engineers delivering tailor made heating solutions to your property using a renewable source saving £££s on your current annual fuel costs and making you eligible for the government’s Renewable Heat Incentive (RHI). Almondsbury Ecoheat can advise on all aspects of these renewable technologies including design, sizing of equipment, planning regulations and finance/ payments. All our installations will be fully planned and where possible pre-fabricated off-site minimising disruption and savings on installation time and costs. Biomass installations will be installed by HEATAS registered operatives and similarly, the heat Pumps installed by Approved Ecodan Installers (AEI’s) (industry accreditations certifying competence). On completion a complete hand over document will be provided giving you full details of the installation including our competence certificates and all design/installation/commissioning/servicing documentation. We are also accredited to Microgeneration Certification Scheme (MCS), this is a UKAS accredited, industry lead and internationally recognised quality assurance scheme, supported by the department of energy and climate change (DECC). The scheme demonstrates our competence to install renewable technologies – such as Biomass and ASHP – on properties in both the domestic and commercial sectors. Our MCS approval gives you the access to the financial incentives (RHI) and, if required, financing via the green deal. Please see the MCS web site for more details. In addition to the MCS, we are also a member of the government approved scheme NAPIT. They are an organisation that strives to uphold the highest standards of professionalism, quality and safe practice and help to make sure the workmanship standards comply with UK legal requirements. We also hold the Renewable Energy Consumer Code (RECC) accreditation. MCS works in partnership with RECC which ensures that MCS installation companies are working to a Trading Standards Institute approved Code of Practice. Please see the RECC web site for more details.